Agastya is a respected Vedic sage in Hindu mythology. In Indian tradition, he is a noted ascetic and an influential scholar. 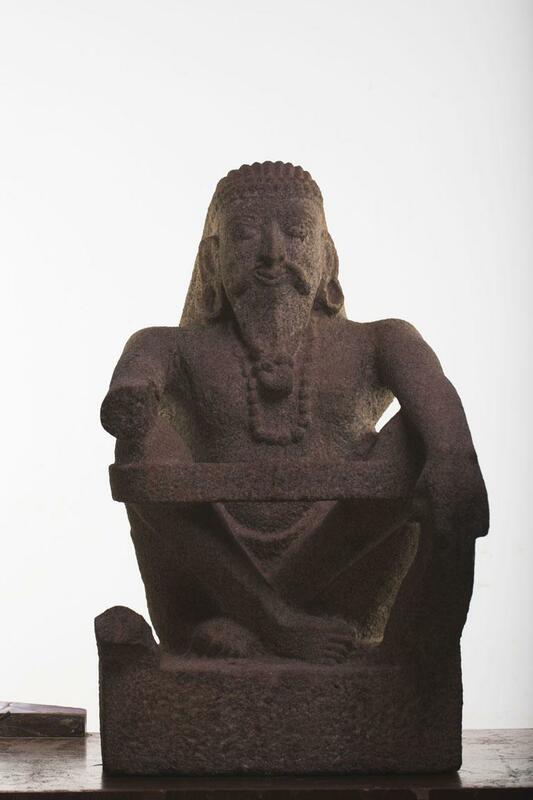 Agastya appears in numerous mythologies and in regional epics including the Ramayana and Mahabharata. This stone figure was unearthed during the work for the Varkala Tunnel. The long bearded face shows the influence of the Egyptian style of sculpture. It is seated in ‘Utkutika pose’. Yoga patta is on the crossed legs. The carving of the chain of beads, its construction and its pose depicts Kerala style. The left hand is broken and the right is seen resting on the knee.